V2563. GINA CIGNA: Arias & Ensembles (w.de Sabata, Elmo, Stignani, Gigli, Merli, Pasero, etc.) from La Fanciulla del West, Turandot, Adriana Lecouvreur, La Wally, Norma, Ballo, Forza, Il Trovatore, La Gioconda & Aida. [A treasurable program restoring the great Cigna to her formidable glory; the sensational 1937 de Sabata Berlin live Nile Scene with her glorious high C and breathtaking diminuendo in 'O Patria mia' is included, plus a live 'In questa reggia' with Merli!] (France) Malibran 157, recorded 1930-41, partially Live Performances. 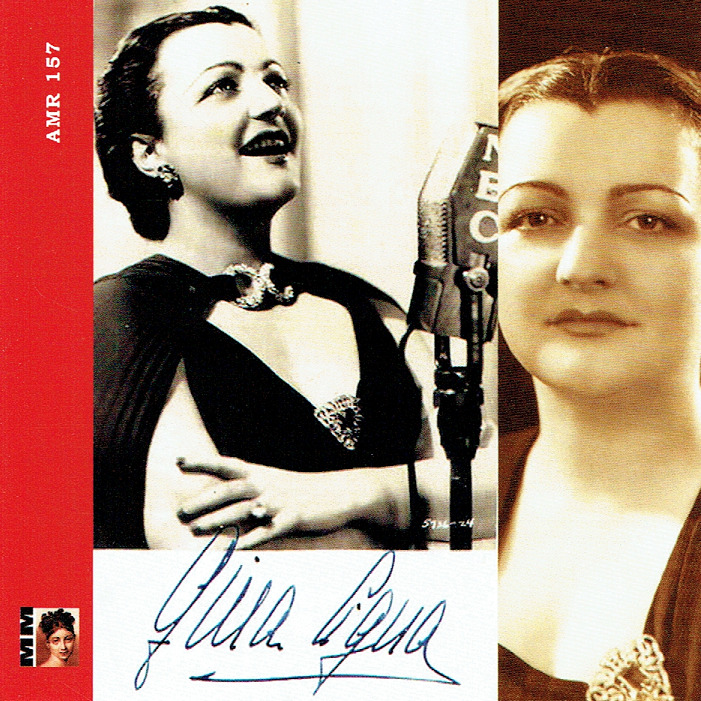 "Gina Cigna was one of the most gifted and admired dramatic sopranos of the 1930s. At La Scala, where she appeared every season throughout the decade, and at many other Italian theatres, she was considered a Norma, an Aida, a Gioconda, and a Turandot without rival. A very handsome woman with a powerful, vibrant voice, she excelled in those roles which most nearly matched her own passionate temperament. Although a motor accident cut short her operatic career at a tragically early age, she continued to teach, first in Canada, then in Italy, until 1965. Gina Cigna was born in Paris in 1900; her father, of Italian origin, was a general in the French army. Having played the piano from an early age, she studied at the Paris Conservatory, where Alfred Cortot was her professor, and embarked on a career as a pianist. In 1923 she married Maurice Sens, a tenor who sang roles such as Gerald (LAKME), Des Grieux (MANON) and Julien (LOUISE) at the Opera-Comique; it was Sens who discovered her voice and suggested that she become a singer. After studying with Lucette Korsoff, on the advice of the great French soprano Emma Calve, Cigna went to Italy. There she worked with other well-known sopranos, Hariclea Darclee, Rosina Storchio and Giannina Russ. In 1926 she auditioned at La Scala for Toscanini, who declared that she had a voice suitable for Verdi and advised her to study the roles of Violetta, Leonora in IL TROVATORE and Aida. After a second audition, however, she was offered the part of Freia in DAS RHEINGOLD and made her debut - under the name Ginette Sens - at La Scala in 1927, attracting little attention. After further study and an engagement at Trieste singing in ANDREA CHENIER and Wolf-Ferrari's SLY, in 1928 she gained her first major success at Carpi, in the title role of Catalani's LORELEY. During 1929 she sang Elena in Boito's MEFISTOFELE at Nice, Marguerite in FAUST at the Verona Arena, her first Aida at the Teatro della Pergola in Florence and Leonora in LA FORZA DEL DESTINO at Pavia, before returning, now under the name of Gina Cigna, to La Scala as Donna Elvira in DON GIOVANNI. This time she scored a great triumph and a few weeks later sang Elisabeth in TANNHAUSER, with equal success; her career was launched. After appearances in Lisbon, Genoa, Parma and Rome, in 1933 Gina Cigna made her Covent Garden debut as Marguerite in the first staged performance in Britain of Berlioz's LA DAMNATION DE FAUST, and also sang Elisabeth de Valois in DON CARLOS. She returned to Covent Garden in 1936 as Tosca; in 1937, when she sang Aida on Coronation Day (12 May), to the annoyance of some members of the audience, who felt that Eva Turner should have been given that honour; and in 1939, when she repeated her Tosca and also sang Leonora in IL TROVATORE. Meanwhile, in 1935, the centenary of the death of Bellini, Gina Cigna sang Alaide in LA STRANIERA at La Scala and Norma in Catania, the composer's birthplace. That year she ventured outside her usual romantic repertory to sing Gluck's ALCESTE at the Maggio Musicale in Florence, where in 1937 she was a notable Poppea in Monteverdi's L'INCORONAZIONE DI POPPEA. Having made a much-acclaimed Metropolitan debut in 1936 as Aida [OP2599], about which Henry Fogel wrote in 2012: ‘Cigna [in her debut at the Metropolitan Opera] is a tempestuous Aida . . .She has a very rich middle voice, and one that is seamlessly bound to the upper and lower registers. And she finds meaning in the text, in the drama, that eludes most of her rivals. This is a total characterization, and one of the major operatic portrayals'], followed by Norma [OP3214], she sang in New York for two seasons, as Leonora (IL TROVATORE), Gioconda, Norma, Donna Elvira and Santuzza in CAVALLERIA RUSTICANA. Aida was again her debut role at San Francisco in 1937, when she also sang Amelia in UN BALLO IN MASCHERA, Norma and Violetta. Toscanini's judgment, that Gina Cigna had a voice suitable for Verdi, was amply proven, as well as those already cited; her Verdi roles included Elvira in ERNANI and Abigaille in NABUCCO. She also sang Mascagni's Isabeau, Catalani's Wally, Zandonai's Francesca da Rimini and Respighi's Fiamma, operas in which her handsome appearance, magnetic personality and dramatic involvement were of paramount importance. As Turandot she was specially praised for the tremendous vocal authority she brought to the role. She also sang in a number of non-Italian operas, taking part in the Italian premieres of Janacek's JENUFA (1941) at Venice and of Richard Strauss' DAPHNE (1942) at La Scala. After the Second World War, Cigna continued her career, appearing chiefly in Italy. On the way to Vicenza to sing Tosca in 1948, she was seriously injured in a motor accident and in consequence was forced to retire from the stage."